Every hunter has their own personalized routine that they resort to once deer season comes to a close. Some resort to coyote hunting in order to keep predators out of their whitetails territory, and others will hide out until the winter weather settles down and spring gets a little bit closer. Although these are both ways to keep your shooting skills sharp for the next deer season, there is one type of hunting that is often forgotten about, and should be taken into consideration during these hard winter months. Rabbit hunting can be as equally productive as any other off season hunting. Not only can it provide you with some tasty meat for the dinner table, but it is fast paced, fun, and gets that itching trigger-finger satisfied. However, these little guys can be tricky to locate and that is why you first must understand where they hide. Rabbits can be found mostly where they are locating food sources or coverage for thermal protection/predator protection. This makes it crucial for hunters to locate areas that are dense in coverage such as thick brush, oaks, or dense woods. However, rabbits have been known to tolerate human activity, causing them to hang out in brush near dwellings, barns, and small wooded areas. In the winters especially, rabbits will tend to burrow into thick piles of leaves, brush, or shrubs for necessary cover. If trees have fallen, or have been destroyed, you can almost bet that rabbits are most likely hanging out here. However, from time to time on a warm sunny winter day, you can catch rabbits out soaking in the sun near south facing slopes. All in all, the three areas to keep a look out for are areas with human activity, sufficient coverage, or a lack of predators. 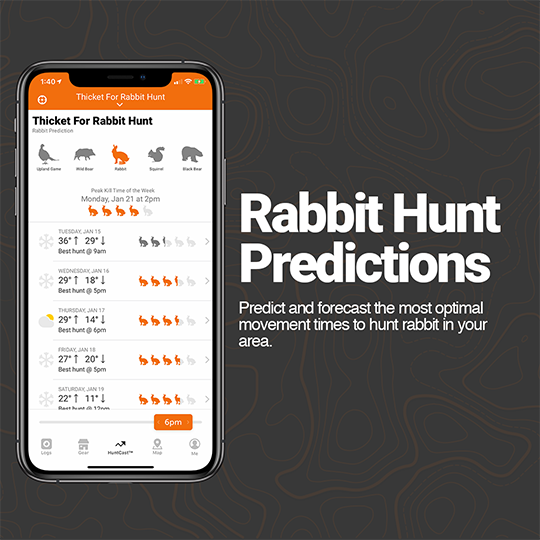 Now that you have a general idea as to where they hide, here are 4 strategies that will help you better hunt for rabbit. Although rabbits mostly are active during the early morning, and late night, they can’t help but move on a sunny day following a cold front. Therefore, watch the forecast and predictions on your HuntWise app to keep up to date on the weather that might be coming. On these sunny days, rabbits will often move at midday, especially on sun-drenched south and southwestern slopes. One of the main reason rabbits have become nocturnal is due to the fact that they have lacked coverage. Therefore, the best places to locate these furry animals is going to be within the dense vegetation of your land. Search for brush-filled hollows, overgrown shrubs, corners of fields, and areas with that have a lot of tall weeds and trees. Many of these spots offer crops, fruits, and other food sources as well, making it not only a place of coverage but also a food source. When approaching rabbits, the best way to kick them out of hiding is to use the “zig-zag” approach. This is going to alarm the animals and hopefully allow you to bag some rabbits. Out of all the game you can hunt, rabbits are not one to lollygag around. Make sure you have your shotgun at port arms when you are in ideal coverage and zig-zagging. You must be ready to shoot at any moment, as once you kick them up they will be flying around. As always, the list could go on and on regarding different strategies to use when it comes to hunting rabbit. However, we feel this is a good start. Understanding where they hide, and the best ways to approach them is going to be crucial to your success. Attempting to stay alert, kick them up, and be quick on the trigger is not only going to keep your skills sharp, but provide you with a nice tasty meal. If you are looking to cook your harvest, click here to view Real Tree’s Timber Table as they have easy and delicious recipes. Otherwise, good luck hunters and shoot straight.